Q Source will be among the dozens of exhibitors at the annual Long Island SMTA Expo and Technical Forum being held Wednesday, October 26, 2016, at the Hyatt Regency Long Island in Hauppauge, NY. This valuable resource for the SMTA community runs from 11:00 a.m. to 5:00 p.m., and offers FREE registration at the event. 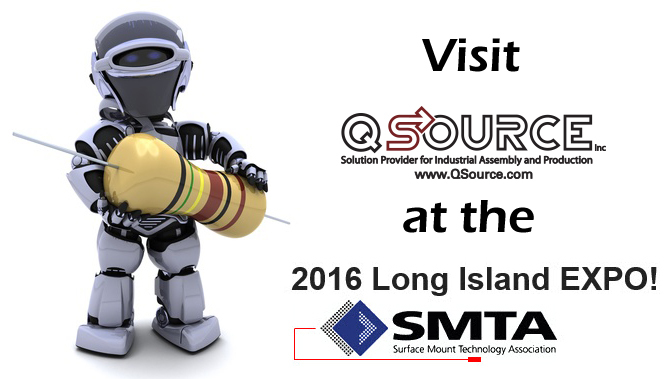 Come visit us at this excellent SMTA show to learn how Q Source can help with your industry needs. For more info about the Long Island SMTA Expo and Technical Forum please visit their Web site. For info about Q Source, or to purchase products from our wide online selection, please check out QSource.com. You may also contact us by phone (800-966-6020) or email.